Is the world a more dangerous place? I will be on CBC Radio’s show ‘The 180’ on Sunday morning giving a talk about whether the world is really becoming a more dangerous place. The show runs from 1100 to 1200 hrs eastern time. Last week I chaired a panel discussing Russia at the annual symposium of the Canadian Association of Security and Intelligence Studies. 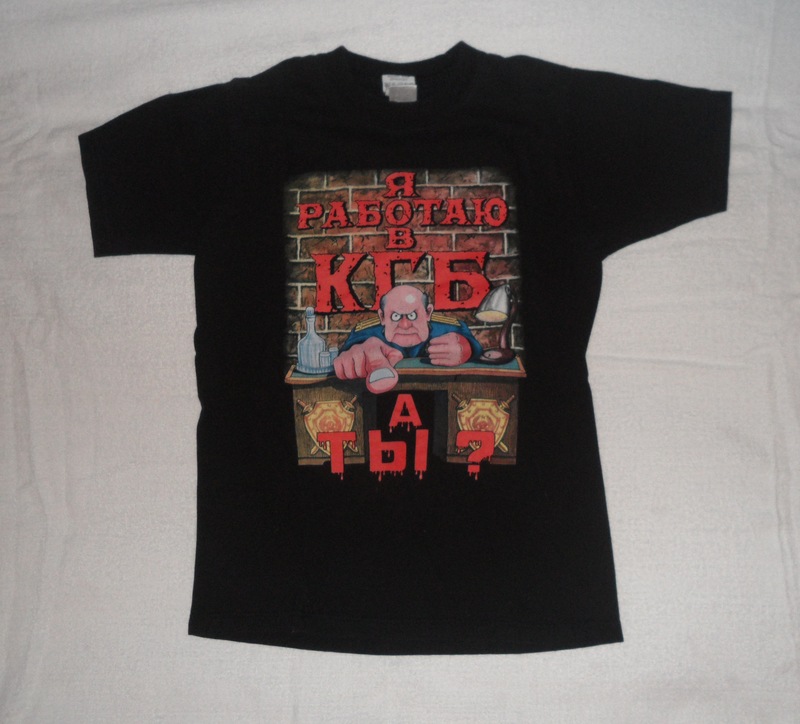 In keeping with the intelligence theme, this week’s Friday object is a t-shirt I picked up at the airport in Moscow with the logo ‘I work in the KGB. 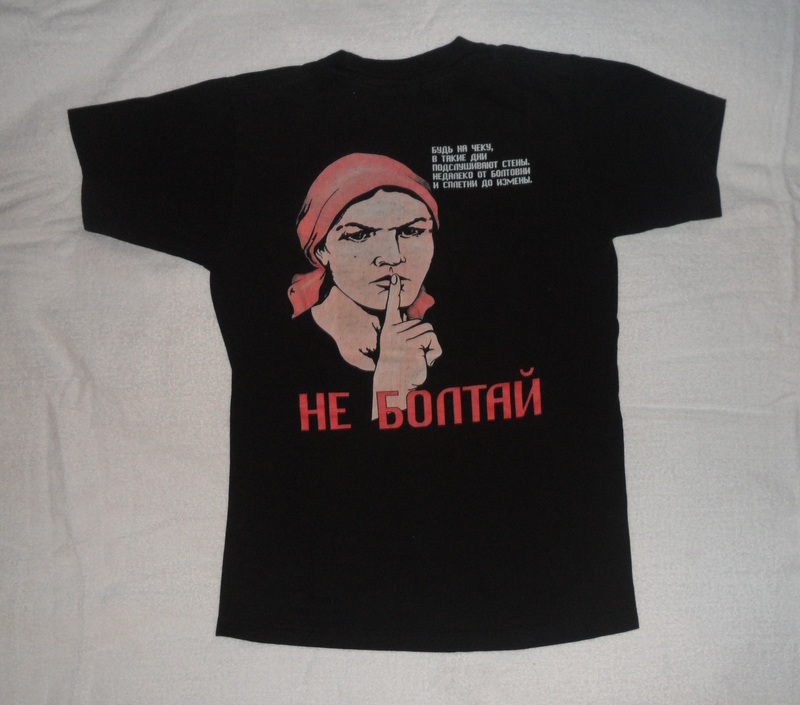 And you?’ ‘No blabbering’ says the back of the shirt. Yesterday, I gave a talk on ‘The Folly of Military Intervention’ at McGill University. Afterwards, one of the students asked me a question about parallels between the wars in Kosovo in 1999 and Ukraine in 2014/15. As I answered, I found myself thinking about the scale of the humanitarian crises in both cases and what this means for supporters of so-called ‘humanitarian intervention’. In 1999, NATO aircraft bombed Yugoslavia for three months. The aim, according to NATO leaders, was to coerce the Yugoslav government to stop human rights abuses in Kosovo. We were told that NATO’s campaign was a humanitarian intervention. The case of Kosovo was subsequently used to justify the concept of the ‘Responsibility to Protect’ (R2P), under which state sovereignty is limited and states have an obligation to protect the citizens of other countries if their rights are being attacked. It is believed that prior to NATO’s war against Yugoslavia, about 2,000 people had been killed in Kosovo. Roughly half of these were Serbs, dead at the hands of the Kosovo Liberation Army, and half were Albanian Kosovars, killed by Yugoslav military and paramilitary forces. While eventually several hundred thousand Kosovars fled their homes to avoid the fighting, the vast majority of these did so only after NATO began its bombing. According to the United Nations, over 5,000 people have been killed in Ukraine’s Donetsk and Lugansk provinces in the past year. It is not clear what percentage is military and what percentage civilian casualties, but it is obvious that the number of civilian deaths in the conflict has been very high. And the situation is getting worse. The Office of the High Commissioner for Human Rights assesses that 262 people died in Eastern Ukraine between 13 and 21 January alone. Meanwhile, the High Commission for Refugees reports that there are now about half a million displaced persons from Donetsk and Lugansk within Ukraine, and that another 200,000 have fled to Russia. The towns and cities of Eastern Ukraine are subjected to daily bombardment from artillery and multiple launch rocket systems. Many of the people who remain there are without electricity and running water. In short, the humanitarian situation in Eastern Ukraine today is far worse than that in Kosovo prior to NATO’s 1999 intervention. Should the Russian Army invade Ukraine in force, drive the Ukrainian Army out of Donetsk and Lugansk, and bring the war to a rapid end? This, in principle, it is entirely capable of doing. R2P suggests that it should. In 1999, NATO killed about 1,500 Yugoslav civilians in the course of its bombing; it is unlikely that the civilian death toll from a Russian invasion would be much higher, and it might even be lower. If R2P is valid, then its proponents should surely welcome such an intervention. In practice, I am sure that they wouldn’t. The point here is not to say that we should demand Russian humanitarian intervention in Ukraine; there are many reasons why that would be an extremely bad thing. Rather, the point is to show the absurdity of the humanitarian warriors’ position. Perhaps they can come up with a good explanation for why humanitarian intervention by NATO is justifiable but similar intervention by Russia in a far worse humanitarian situation would not be. I would be interested to hear it. Misperceptions of others – this can take many forms, but states are particularly prone to misperceiving other states’ intentions, for instance seeing aggressive intent where none is present. Misperception of yourself – people and states tend to view themselves as benign, and also to over-estimate their own capabilities. Misperception of how other people perceive you – because you consider yourself to be benign, you may have great difficulty in believing that other people could view you and your actions differently. It is worth noting that all three sorts of misperception are connected. You believe that what you are doing is a good thing, done for good reasons, even though in reality you may be doing harm (type #2 above). You believe that everybody else must understand that your motives are good (type #3). So, if they are doing things you don’t like, it is not because they are reacting to your actions, but because they are malevolent (type #1). The West perceives a threat from Iran, and believes that Iran is building nuclear weapons and missiles capable of carrying nuclear warheads. This is the first misperception. Iran isn’t building such weapons and certainly doesn’t have the means, let alone the intention, of nuking Europe. But the West has become paranoid about Iran, so the West believes that it is and does. The West, therefore also believes that it must do something to defend itself from this threat, which means building a missile defence shield in Europe. The Russians look at this, and are perplexed. They know that the Iranian nuclear missile threat doesn’t exist, so they don’t believe the West when it says that the missile defence shield is to guard against Iran. But at this point, the Russians add a mistake of their own. They assume that Western leaders are rational actors, who wouldn’t be spending billions of dollars building a shield against a threat which doesn’t exist. Therefore, they conclude that the shield must be directed against Russia. This is the second misperception, and it leads to the Russians getting angry with the West. The West then gets angry too. It knows that its intentions are defensive. It therefore believes that the Russians must know that too. This is the third misperception. The result is that the West doesn’t take seriously the Russian complaints. Relations between the two sides deteriorate still further. We can see the same dynamic at work in other examples. NATO views itself as a ‘force for good’, and cannot see that on occasion it has acted aggressively (e.g. in Kosovo and Libya). It misperceives itself. Russia then misperceives NATO, fearing that NATO’s actions in those places could be indicative of aggressive intent against Russia. In reality, NATO has no intention of attacking Russia, but Russians are not so sure of that. Then NATO can’t understand how Russia feels. If Russia is against NATO expansion, that can’t be because of genuine fears about NATO, so it must be because of Russia’s own imperialist agenda in the countries of the former Soviet Union. Russia, meanwhile, perceives the annexation of Crimea as righting a historical wrong. It knows that it has no desire to annex parts of the Baltic States, so why should they worry? If NATO sends more troops to the Baltics, that must be part of NATO’s plans to undermine Russia, not a product of anything Russia has done. In these situations there is no real, underlying reason for those involved to be at loggerheads. It is hard to know how to overcome this problem, but the solution perhaps lies in understanding it for what it is: a problem of misperception, not one of deeply incompatible interests. 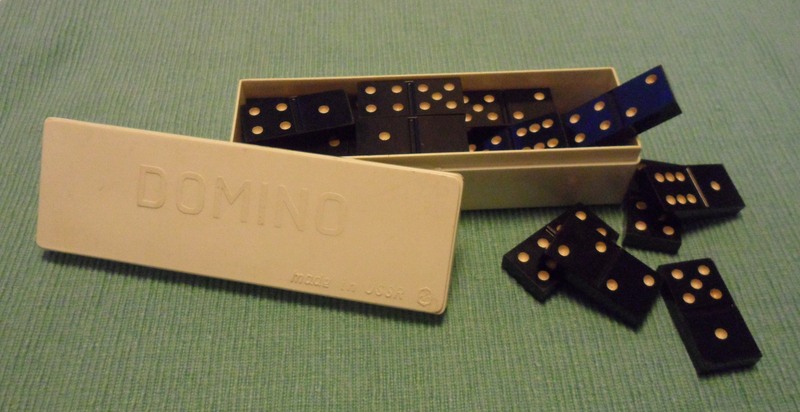 My Soviet roommate gave me these dominoes in 1987. I learnt a lot of colourful Russian language playing games with him and others! I have often wondered why the lid says ‘Domino’ and ‘made in USSR’ in English. The lack of manoeuvre, the dominance of the artillery, and the seemingly pointless battles over tiny pieces of territory – most notably Donetsk airport – increasingly resemble the First World War, with the important exception that combat is taking place not in the countryside but in cities. Civilians, therefore, are suffering in large numbers. A hundred years ago, generals dreamt of breaking through ‘the mud and blood to the green fields beyond’, as the motto of the Tank Corps put it. If the warring parties in Ukraine are unwilling to make peace, the only way for the suffering to end is for one or other of them to achieve this. Right now, the rebels appear to have the initiative. In the past week, they have captured the new terminal of what remains of Donetsk airport, entered the nearby village of Peski, taken ‘checkpoint 31’ in Lugansk Province, and advanced a short distance towards Mariupol. This has been made possible by what appears to be a substantial increase in military support from Russia (above all, there must have been a supply of a copious volume of artillery shells). But is not clear how far Russia is willing to go. The signals are confusing. On the one hand, Russian officials have been uttering what sound like threats, saying that in escalating military activity the Ukrainians have made a blunder which they will regret; on the other hand, the Russian government has announced that it wishes to work to produce a new ceasefire. Russia seems to be willing to give the rebels what they need to avoid defeat, but it doesn’t seem to be willing to give them what they need for victory. The resources available to the Ukrainian state far outweigh those available to the rebels – a population of some 40 million people, and huge stores of military equipment left over from the Soviet era (much of it in a poor state of repair, but theoretically usable given a bit of effort). Were Ukraine to wage total war, committing its entire population and economy, it could crush the rebellion (albeit with enormous bloodshed, and assuming that doing so did not provoke a massive Russian response). Ukraine’s president Petro Poroshenko recently announced a new round of conscription designed to increase the size of the armed forces to 250,000. This is not total war, and insufficient to defeat the rebels. Knowing that anything more would produce serious social, economic, and political problems, Kiev is still fighting its war half-heartedly. 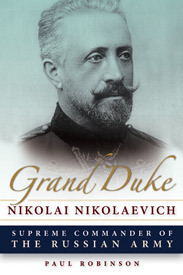 Imperial Russia’s most famous military theorist, M.I. Dragomirov, commented that war consisted of two components: the physical and the moral. Put another way, war is a matter of mass and of will. The rebels have the will, but not the mass. The Ukrainians, by contrast, have the mass but not the will. For the stalemate to be broken by military means, one or other of these has to change.